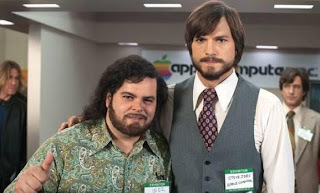 “Jobs,” a bio film about Apple computer founder Steve Jobs, begins with Aston Kutcher as an older Jobs addressing his Apple makers about his latest invention, some super-cool gadget that can store over a thousand of one’s favorite songs. He stands in an auditorium on a stage with the Apple logo towering behind him. Immediately, this film looks like a commercial for Apple and for the next two hours, it never seems to rise above this infomercial format. Considering the obvious talent on board and the extent of research involved (real locations were used), it’s a shame this couldn’t be a more exciting movie. Some biography plot points are in place but Steve Jobs’ life here is as streamed-down as the Apple computer itself, just a slick monitor with everything neatly packed away. And the customers are supposed to be in awe of this genius. To me, this Steve Jobs became increasingly boring – all hardware with the pretense of a soul. But he sure looks cute as personified by Aston Kutcher. I can imagine Kutcher is better suited for comedies. He seems to have the chops to play driven characters, but the script here is as thin as his body or the size of an Apple monitor. Typically, the film flashes back to young Jobs in college – barefoot, too-brainy for classes, an LSD user and regular ladies’ man. Like the machine, he has flaws, but don’t expect to ever understand them. Because he’s presented as such a genius-saint, no explanations are necessary. This becomes frustrating to the viewer would might know nothing about Jobs. I can’t imagine that “Jobs” would appeal to many – unless one finds bloated, heated discussions about font size interesting. The film is sort of like one long motivational creed to creativity – without really being creative. At the end, there’s a testimonial to all the fun and trouble-making characters who helped Jobs create this corporation, but I didn’t remember seeing any of this. My mind floated back in time to seeing The Social Network which was invigorating and bothered to have original music. This film doesn’t even bother to show how this “revolution” really affected the world after portending that it did. It’s just a glossy scan of this real person’s life. As is the case for many biographies, I prefer a decent documentary.